Post-Holiday Anise Pecan Cookies | We Like to Cook! The holidays are over, the kids are back in school and the house is quiet. Too quiet. I find myself missing the hubbub of the holiday season; football games blaring in the background, people coming and going, and always something cooking, baking or grilling. I didn't mind the extra vacuuming, loads laundry or dish washing duty. I also didn't mind the plethora of cookies in the pantry! The supply of biscotti, pizzelles, torrones and other goodies that seemed endless in mid-December are distant memories by mid-January. Sitting with a piping cup of coffee wistfully wishing for a cookie to dunk, I had a jolt of recollection. 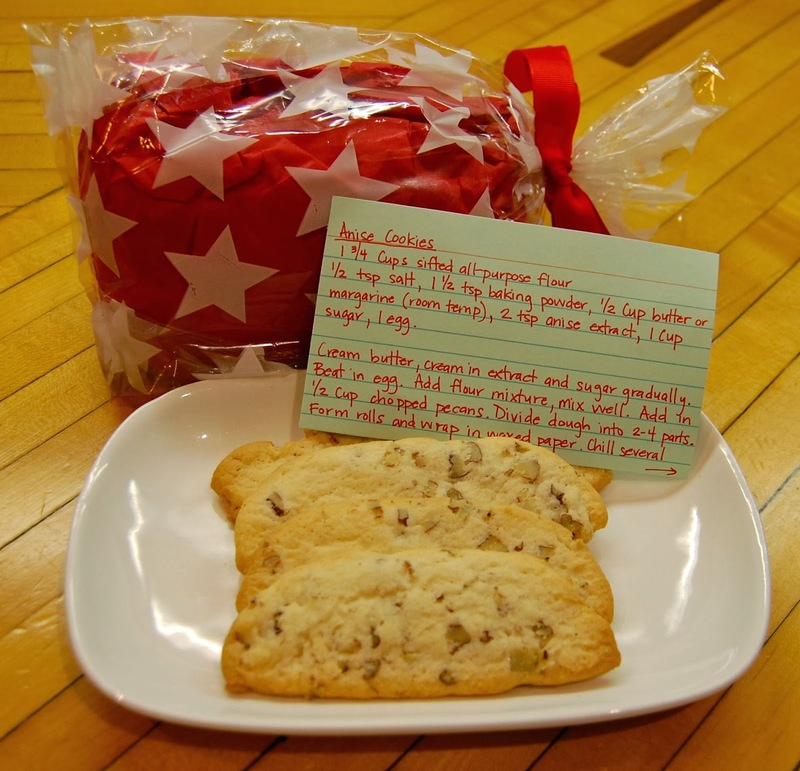 Our neighbor, Amanda, knowing that we were inundating with baked goods, shared cookie dough for my favorite anise cookies rather than baking the treats. Taste buds tempted, I laid the dough on the counter to thaw and preheated the oven realizing that this might be one of the most appreciated holiday gifts that I received. Anise is a common ingredient in Italian cooking especially in the making of Italian sausages, and is a flavor we enjoy in many sweet and savory dishes. Anise is also an excellent remedy for asthma, bronchitis cough and digestive disorders such indigestion, stomach pain, and nausea. Cream butter, sugar and anise extract together. Slowly beat in egg. Add flour, salt, and baking powder to the creamed butter mixture and blend until smooth. Stir in pecans and mix well. Divide the cookie dough into two parts and form them into rolls. Wrap the rolls in waxed paper and chill for several hours. Preheat oven to 400 degrees F, Cut the dough into 1/8” slices and place on a greased cookie sheet. Bake the cookies for 8-10 minutes or until lightly browned.